Whenever I think about buying an ice-cream maker (which is sadly often) I make a semifreddo and it doesn’t seem as urgent. This is an old Nigella Lawson recipe for honey semifreddo, which is also delicious. I’ve tried other semifreddo recipes but always come back to this. It isn’t too sweet, it's creamy and not icy, and it isn’t complicated. Crush raspberries with the back of a spoon until they’re pulpy and saucy and set aside. Next attack the pomegranate. If you know how to de-seed one, move onto the next paragraph. If you don’t, slice the pomegranate around the middle. Grab one half so the cut side is in your palm and literally whack the back of the skin side with a heavy spoon. 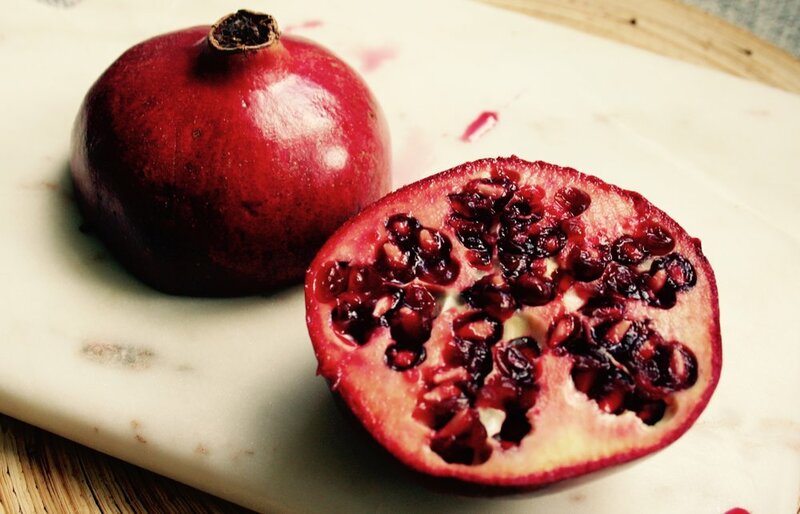 All of the pomegranate seeds should pop out into your hand. Keep turning and whacking until they’re all set free. Whatever you do, don’t start picking them out, you’ll end up with a white-pithy nightmare. Add most of the pomegranate seeds to the raspberries for later and keep a handful out for garnishing. Put a large pot, with a small amount of water in the bottom, over a low-medium heat and bring to a simmer. You’ll whisk the eggs over this in a minute. Whip the cream into firm peaks and set aside. Put eggs and sugar into a metal bowl and whisk over the simmering water. You can do this for 8-10 minutes with a big balloon whisk or 4-5 minutes with an electric one. Either way you’ll get a very pale thick consistency. Scrape the sides of the bowl down a few times during this process to stop the eggs from cooking on the sides. Once that’s done, fold the cream into the eggs, carefully but so that’s it all mixed through. If by chance you do over whip the cream, as I have done many times, add a spoonful of cream first and beat into the egg mix to soften it a bit. Then Add cream a few spoonful’s at a time to avoid lumps. Finally stir through raspberry and pomegranate mix. Line a medium tin (1 litre capacity) of your choice with cling film, being generous with the overhang. 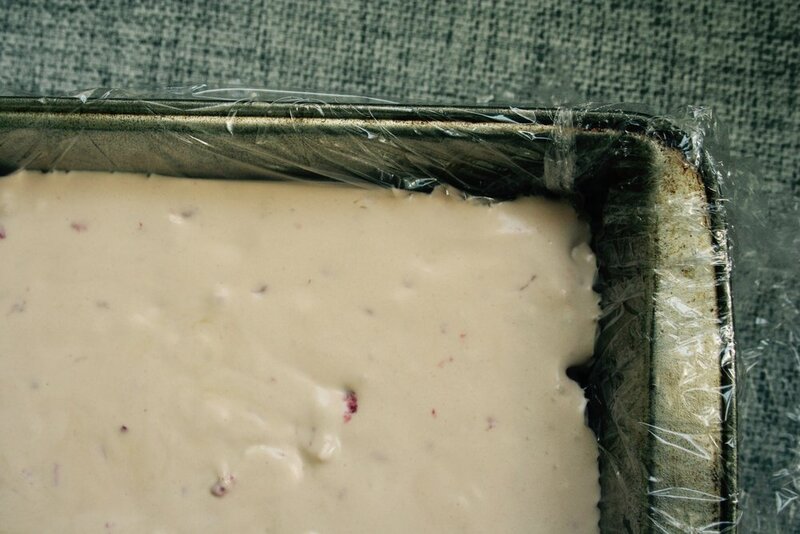 Pour mix in and cover gently with the overhanging cling film and freeze for 4- 5 hours. When it’s ready flip the semifreddo out onto a plate and peel off the cling film. You can set in a round tin and serve whole with fresh pomegranate seeds scattered over the top. Or, as I did, set in a rectangle tin, cut into six squares ands serve in little glasses. Add rose petals or fresh raspberries if you have them. Make sure you leave the semifreddo out of the freezer for 10-15 minutes to thaw a bit before serving. It will start to melt around the edges which is perfect.